The contrast could not be starker between the celebratory proceedings marking the opening of the U.S. embassy in Jerusalem and the border clashes on Monday that have resulted in 52 casualties — the bloodiest day for Gaza since the 2014 war between Hamas and Israel. Why it matters: Both events add more fuel to the already combustible dynamics between the Palestinians and Israel. The embassy move has led the Palestinian Authority to sever contact with President Trump's administration, severely reducing any chances for the resumption of peace diplomacy, while the deaths of Gazan protestors have increased the possibility of another war between Israel and Hamas. The background: Trump’s decision to recognize Jerusalem as Israel’s capital and the U.S. embassy's new home fulfills his campaign promise to finally implement the 1995 Jerusalem Embassy Act. Previous presidents, concerned with the repercussions of such a decision, had signed national security waivers every six months postponing the relocation. While enthusiastically welcomed in Israel, the decision is opposed by the majority of the international community. It has also caused anger among Palestinian leaders and public. 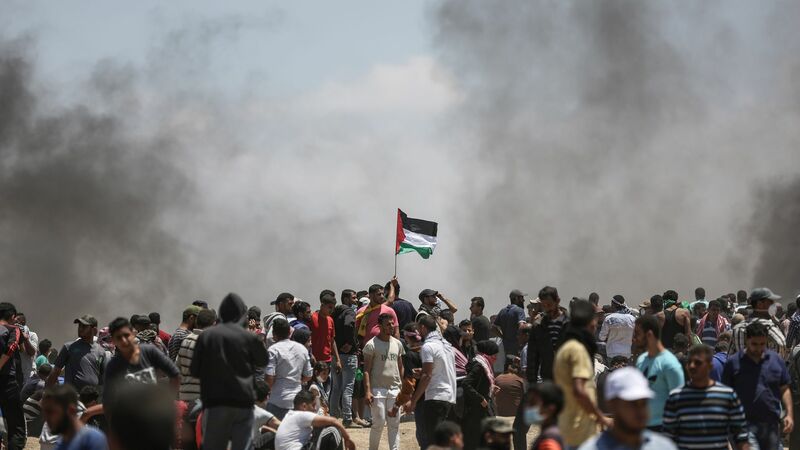 The embassy protests in Gaza Monday follow a series of planned weekly demonstrations that began March 30 and culminate on May 15, the date marking the creation of Israel in 1948 that Palestinians termed Nakba (Arabic for “catastrophe”) Day. Protestors, who include Hamas operatives as well as a much larger number of Gazan civilians, have been driven by a combination of nationalistic aims — especially the “right of return” for Palestinian refugees displaced in the 1948 war and their descendants — as well as the sharply deteriorating humanitarian situation in the coastal strip. While largely peaceful, some of these demonstrators did make attempts to breach the border fence between Gaza and Israel and to use kites fitted with Molotovs. Before Monday's casualties, more than 40 Palestinians had already been killed by Israeli fire since the protests began. What's next: The immediate concern is whether the situation along the border can be de-escalated. While conventional wisdom holds that neither Hamas nor Israel are interested in a new all-out war, the high number of Palestinian casualties may impel escalation. Even if immediate escalation is avoided, however, the lack of policies to resolve the dire humanitarian situation in Gaza will likely result in ongoing instability in the impoverished, densely populated enclave. While President Trump and the administration talk about an American peace plan, the tensions in Gaza and the diplomatic disruption caused by the embassy move have deepened skepticism about its prospects of success. Ghaith al-Omari is a senior fellow at the Washington Institute for Near East Policy. The demonstration in Gaza Friday, during which at least 15 Palestinians were killed and more than 1,000 injured, marked the beginning of a protest effort slated to culminate on May 15. The campaign centers on Palestinian “right of return” demands, which Israel has rejected as anathema to its very existence as a homeland for the Jewish people. Why it matters: The protests are the most intense confrontations between Palestinians and Israel since the 2014 Gaza war. Coming at a highly volatile time, with both the peace process and internal Palestinian politics in crisis, these protests are likely to escalate the weeks ahead and may spread to the West Bank. The background: Reconciliation talks between Hamas and the dominant Fatah party have collapsed, and both organizations are rapidly losing support among the Palestinian public. While Hamas dominates these protests, all Palestinian factions, including Fatah, are cosponsoring them. Internationally, this campaign aims to confront Israel with the dilemma of responding to largely unarmed mass protests. The protestors plan to maintain a constant presence in newly erected camps along the Gaza–Israel border — symbolically named after villages destroyed in the 1948 war — with spikes of activity on Fridays and other significant dates, such as Land Day (March 30), the opening of the U.S. embassy in Jerusalem and the 70th anniversary of the 1948 war. Domestically, however, Hamas hopes these protests will build its own support network. Many of the demonstrators are not Hamas members, yet Hamas which has uncontested control over the Gaza Strip is administering the protests in practice. What's next: These demonstrations risk further outbreaks of violence, even if not at levels of the 2009, 2012 and 2014 wars. While primarily slated to take place in Gaza, they could worsen the West Bank’s security situation if they spread there spontaneously or in an attempt by Fatah to flaunt its ability to mobilize crowds and burnish its nationalistic credentials.